His energy was contagious; we giggled like little children awaiting a big surprise as we excitedly piled into the backseat of his car. We were in Bohol, the Philippines’ tenth largest island, to celebrate our one-year wedding anniversary. And though we could have picked out anywhere in the world to commemorate the special day, we had chosen Bohol on the sheer promise of encountering the world’s smallest primate and an uncanny landscape of over 1,000 “chocolate” mounds. Our friends had stared at us quizzically when we first told them we were trading in the beaches of Thailand for the odd attractions of Bohol. Would our off-the-beaten-track travel choice be worth it? We were about to find out. 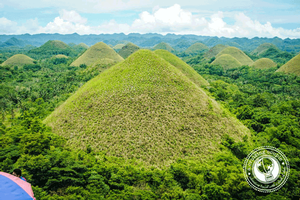 The first stop on our journey was a visit to the region’s iconic Chocolate Hills, over 1,000 large limestone domes that dot the province of Bohol. 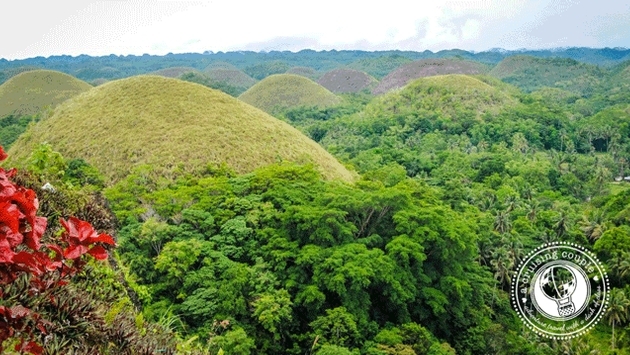 “Of course we call them the Chocolate Hills because they look like chocolate. But during rainy season the hills are actually covered in a green grass. It is only during dry season that the grass turns brown and our hills become chocolate,” our driver informed us. But as we approached the first of the hills, it immediately became apparent why the chocolate hills are so awe-inspiring—and it’s not because they resemble a confectionary delight. The Chocolate Hills look wonderfully artificial, as if a toddler with a crayon has colored them into the foreground of a farmland scene. Incredibly large and extending out as far as the eye can see, we marveled at how the chocolate hills could have possibly come into existence. It’s a question that the local people and scientists have been asking for a long time. One legend has it that two giants got into a huge fight; the stones and sand they threw at each other became the Chocolate Hills. Another story has it that one giant fell in love with a mortal, and when she died the giant’s tears turned into the mounds. However romantic, scientists have deemed the more logical explanation to be that tectonic movements uplifted marine limestone, which weathered away from water and wind to form the conical hills. No matter what the reason for their existence, the Chocolate Hills are certainly a sight to behold. We took our time snapping photographs and observing the way the hills seemed to “pop” out of the farmland from nowhere. But my excitement for the next attraction was escalating, and I could soon hold it back no longer. The tarsier is the world’s smallest primate, a shy and nocturnal animal. Their characteristic eyes, bulging and saucer-shaped, easily set them apart. (The tarsier’s eyes are so large that they are actually bigger than their brains.) But if the huge eyes weren’t already slightly creepy, tarsiers can also turn their necks 180 degrees to compensate for the fact that their eyes cannot move within their sockets. Now throw on the tail of a rat, the legs of a frog and the feet of a gecko, and you have our friend the tarsier. Dan could not for the life of him understand why I found these critters to be so charming, but I simply could not resist them. Each time I had seen a photo of a tarsier on the Internet, an inescapable “aww” had slipped from my mouth. I could only imagine how ridiculous I would sound when I saw them in real life. We arrived at The Tarsier Sanctuary, a foundation with the goal to protect the Philippine tarsier and its habitat, while also providing economic opportunities for the local population. We paid our 50 pesos and excitedly began to walk along the well-marked paths, keeping our eyes out for the hidden animals. Small enough to fit in the palm of your hand and typically only active at night, it can be a challenging task to catch sight of them during the day. Lucky for us, we glimpsed a tail just moments into our walk. 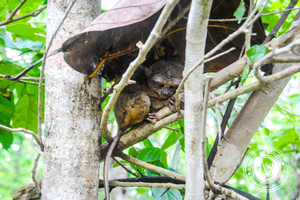 We followed the line of vision, and there it was—our first tarsier, just as cute as I could possibly have imagined, peeking out at us from under a leaf. My delightful squealing began. Once we saw the one tarsier, we began to see them everywhere. 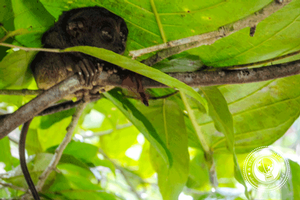 The tarsiers are free to roam throughout the natural sanctuary, even leaving it to hunt for food if they please. Heartbreakingly, we learned that if the tarsiers are kept in cages, they are known to commit suicide by banging their head against their enclosure. The work that The Tarsier Sanctuary is doing is both admirable and necessary to protect this endangered animal from extinction. “So I told you. Two of the Philippines’ best attractions—maybe even two of the world’s. You liked it?” A grin spread across our driver’s face as we reunited at the vehicle. “Absolutely,” we assured him. Beautiful beaches and Buddhist temples we could find throughout Southeast Asia. But the Chocolate Hills and the tarsiers? Those were two quirky, once-in-a-lifetime experiences we weren’t soon to forget. Additional tips: The Chocolate Hills and Tarsier Sanctuary are both easily experienced in one day. It is possible to arrive using public transportation or jeepneys, but we recommend hiring your own driver for flexibility and efficiency. Bohol and especially the nearby islands boast plenty of beaches and jungle experiences to occupy the remainder of your vacation time.